D: What do you think of the current state of graphic adventure games? It has been said in past years that the genre was dead, but the games published in recent months seem to prove exactly the contrary. R: R: Graphic adventures are settling into their own niche market – a market base that is actually much larger than many in the mainstream game industry realize. D: What do you think of the use of 3D engines in graphical adventures (like Gabriel Knight 3, Broken Sword 3 and Dreamfall)? R: It’s fine as long as the animation and models look good. We prefer not using any 3D action sequences in our game. I’m a purist and like my adventure games to be adventure games, not action/adventure hybrids. That’s not to say I don’t like 3D action games though. I was a big fan of the original Tomb Raider! D: Besides being developers you are also videogamers. Tell us three graphic adventures that you have preferred in recent years. 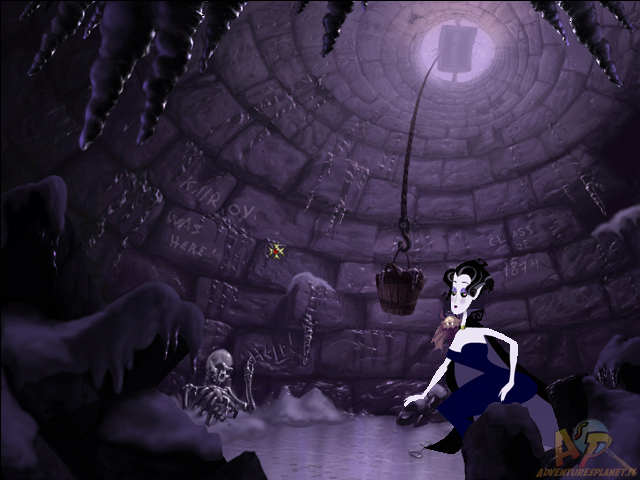 R: Syberia, Grim Fandango, and Longest Journey are at the top of the list. I love the dialogue in Grim Fandango. Nobody can write dialogue like Tim Schaffer. It had a good combination of drama and comedy. Syberia and Longest Journey had good stories and excellent graphics. I especially liked Syberia’s point and click interface and 3D graphics. 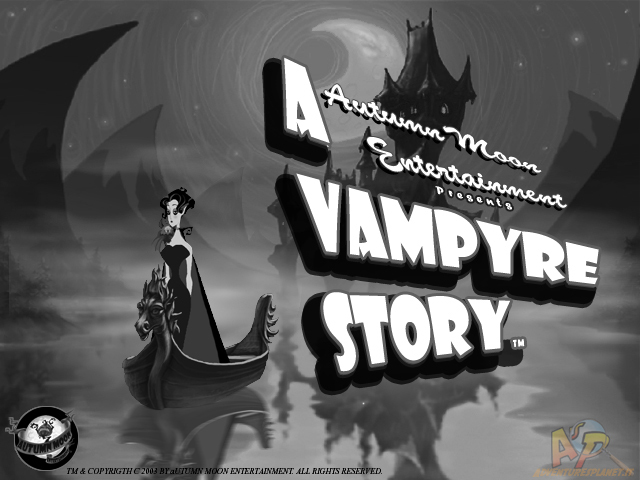 D: The world community of adventure gamers greatly anticipate A Vampyre Story. Can you tell us more about the game? R: Sure. In the late 1880’s a young opera singer’s career is interrupted when she’s turned into a vampire and taken away to a castle far away from her home. To fulfill her life’s dream, Mona has to overcome an obsessed phantom lover, two religious zealots bent on her destruction, a hoard of rioting villagers, a mad scientist determined to dissect her, and even an opera rival, all so that she may become Paris’s most beloved diva! D: Vampires. The theme is without a doubt interesting and controversial: you can take material from the traditional dark and gothic representation? How did you deal with this theme in your game? R: We are trying to replicate the ambiance but not necessarily the horror element. We’re much more whimsical in our approach. It’s similar to the way Mel Brooks dealt with horror in his film, Young Frankenstein. It’s more of a tribute to the horror genre rather than an actual horror story. D: Also your game has a female as the main character. In your opinion why are more adventure games (Syberia, Longest Journey, Still Life) making this choice? R: Maybe for the same reason James Cameron uses a lot of strong females in his movies. Women represent emotion and they think about things more before acting. They don’t jump to action as quickly or resort to violence to solve their problems. They usually use violence as a last resort. We didn’t plan to use a female as the lead character. 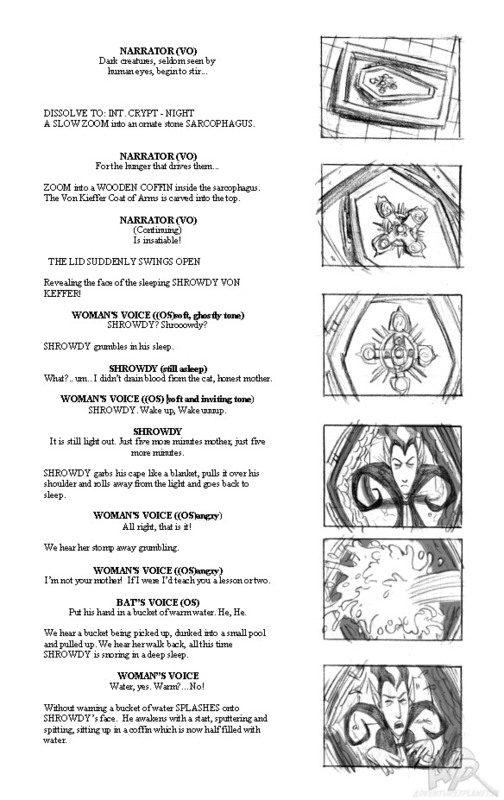 But as the story developed, it turned into a sort of analogy of women in a male dominated world. In a way, vampires represent the stigma placed on modern women, especially when it comes to freedom, opinions and sexuality. 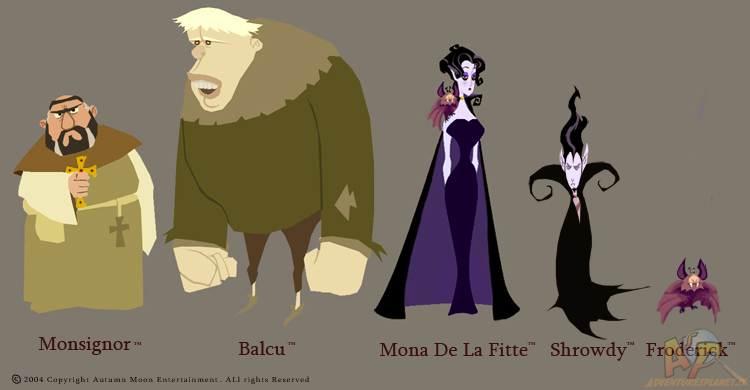 The villains in the game have come to represent certain obstacles that women have in a modern world. The setting is also good too because it takes place in the beginning of the Industrial Age when women were starting to come into their own power. D: Which technology do you plan to use for your title? R: We would like to use the Virtools engine that Syberia used so successfully. 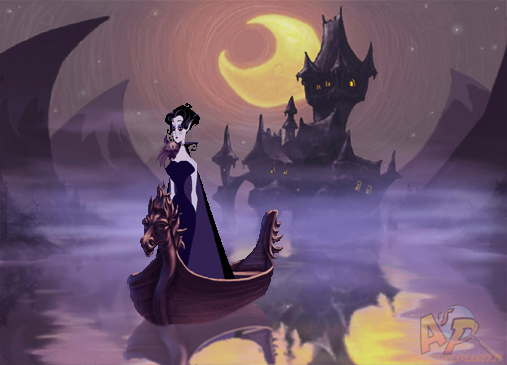 Originally, we were going to do the game in 2D animation. But it became obvious early on that method was going to be time consuming and expensive. 3D animation is faster, cheaper, and easier to achieve a smoother, more seamless look to the animation. Our demo and current screenshots are all in 2D. But for the final game, we plan to go with 3D. D: How far along are you with the development of your game? R: We have a playable proof of concept that we are now shopping around to publishers. 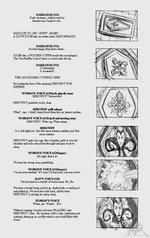 The story has been fully written and much of the gameplay has been designed. We’re currently in the process of storyboarding the cut scenes, designing the characters and working on backgrounds for the final game. D: Which type of interface will you use? R: We’re using a radial verb icon GUI, similar to the one in Curse of Monkey Island, with the addition of a sub-radial GUI that allows the player to use Mona’s vampire powers. We are also adding a basic hint system and a journal so players can keep track of where they left off and which puzzles they still need to solve. 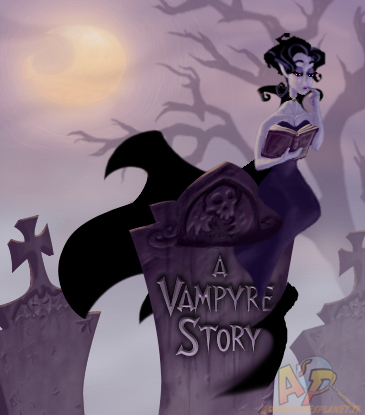 D: What type of puzzles will we find in A Vampyre Story? What particular powers will the characters of the game be able to use? R: There will be a lot of inventory puzzles and puzzles based on the limitations of being a vampire. The solutions will often be more entertaining than logical. Mona will receive a new vampire power in almost every chapter of the game. 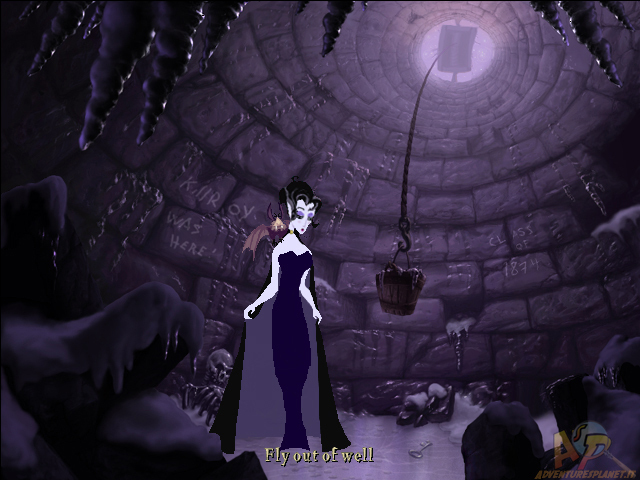 At the beginning of the game, Mona’s not fully aware that she is a vampire. Her bat companion, Froderick, likes to say she’s in denial. 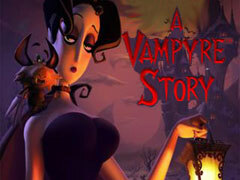 But as the player progresses thru the game, Mona will slowly but surely discover new vampire powers. These powers will be used to solve more difficult and challenging puzzles. At first, Mona will be able to turn into a bat. Draining a victim of his blood, influencing the weather, hypnotism and other powers will soon follow. D: What type of situations will we encounter in A Vampire Story? Will they be limited to the humorous or...? R: There should be no mistake: this is a humorous game, not a serious one. The puzzles and the story will reflect that. D: Do you plan to distribute the game in other countries? Are you already in contact with other distributors for the release of your AG? R: Yes, we’ll try to distribute it in as many countries as possible. D: The exit of the game is previewed for 2005 forwarded. 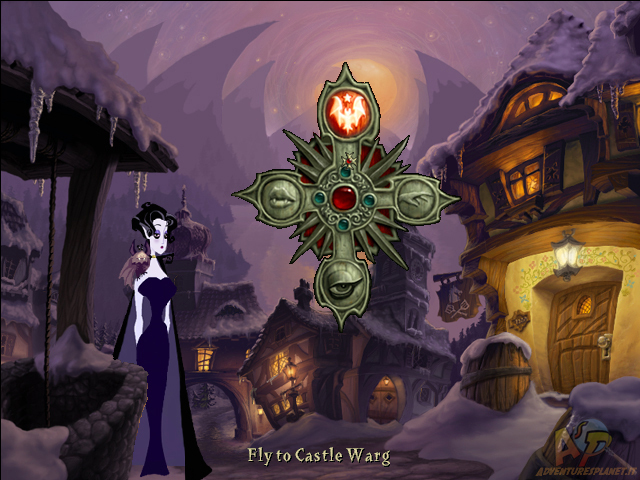 Do you have other game plans after finishing A Vampyre Story? R: Yes. We are working on another idea right now but our plans also depend on what the publisher is interested in. If they want a sequel, etc. D: In conclusion, do you want to add something for all the Italian adventurers? R: We are very excited about the amount of fan mail and interest A Vampyre Story has gotten. We hope that this support will help us partner with a publisher. Thanks again to all of our Italian fans for their support!